For many of you it’s been a long winter with the snow falling late into the season and the temperature trying to climb its way up above freezing. Well, I think we should soon be in the clear with the days getting longer and the sun warming the earth. It’s not too early to start thinking about getting the gardens prepped and ready as well as introducing the wonderful colors of spring into our homes. Now is the time to refresh your entry doors and interiors by showcasing some of our newest designs for spring. We appreciate many of your comments. For example, Carol M. in Massachusetts writes: “what a warm inviting difference in our home as we received a recent wreath as a gift from our daughter”. Wow, when we read these kinds of comments it reinforces our commitment to customer service and how important and inspiring our hand-crafted designs mean when given as a special gift. We continue to strive to bring you the very best, and for this spring we suggest brightening your homes with one of our newest designs called the “Hydrangea and Lavender Wreath”. 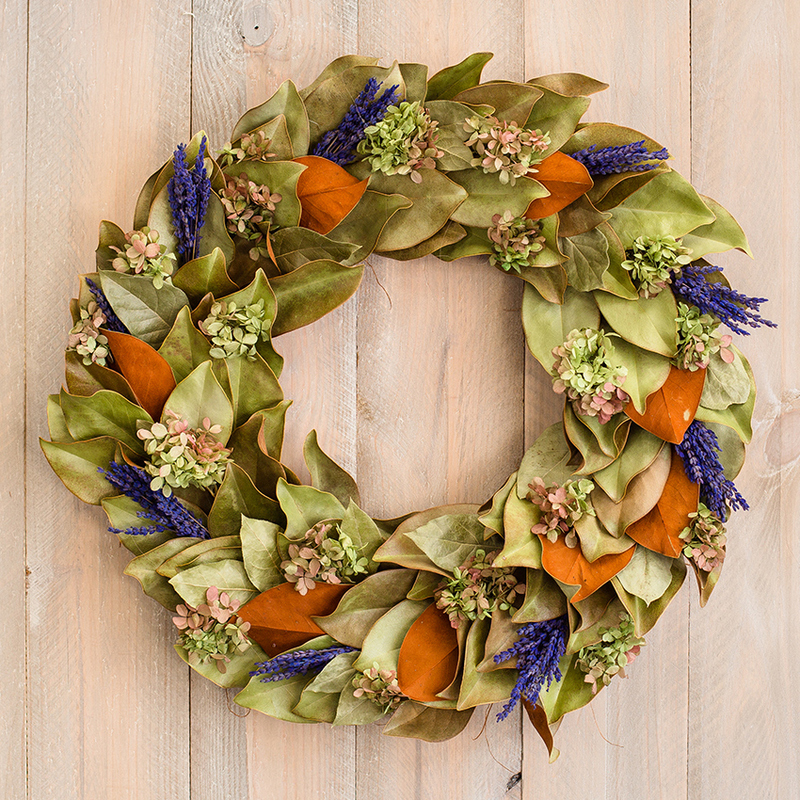 This dried and preserved wreath consists of our iconic magnolia foliage, interspersed with bundles of lavender and antique hydrangea. This wreath has also been an extremely popular gift given for birthdays as well as a new baby gift with its light fragrance of lavender that is both calming and soothing. 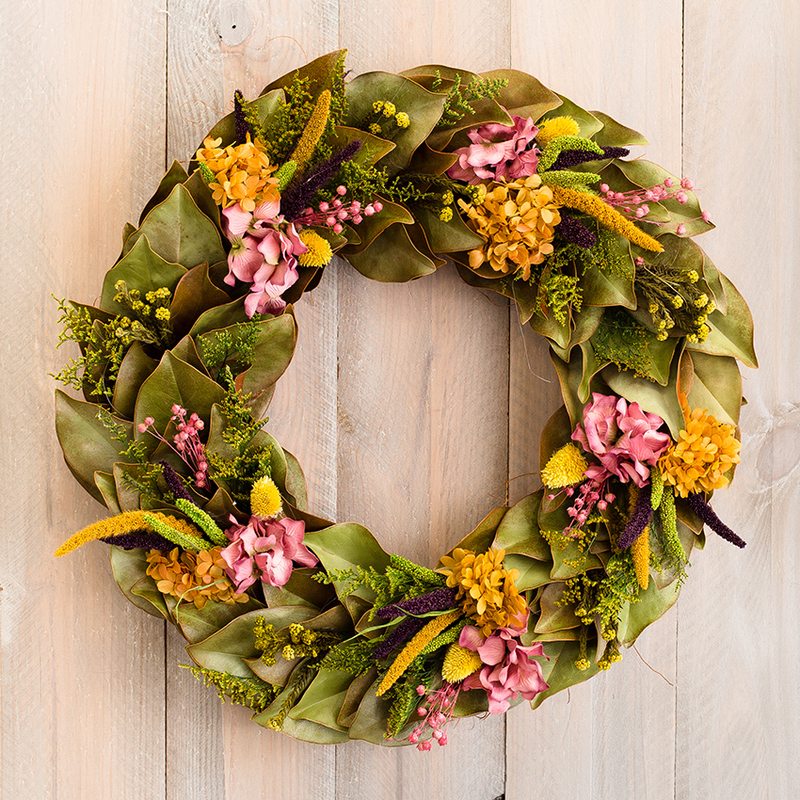 For the upcoming Mother’s Day holiday you can’t go wrong giving our new “Mango & Pepperberry Wreath”. Beautiful in soft pinks and creamy yellows, Mom will surely be thrilled with this textural masterpiece. But why wait until Mother’s Day? Show Mom how much she means to you, send a specially designed one-of-a-kind wreath today! 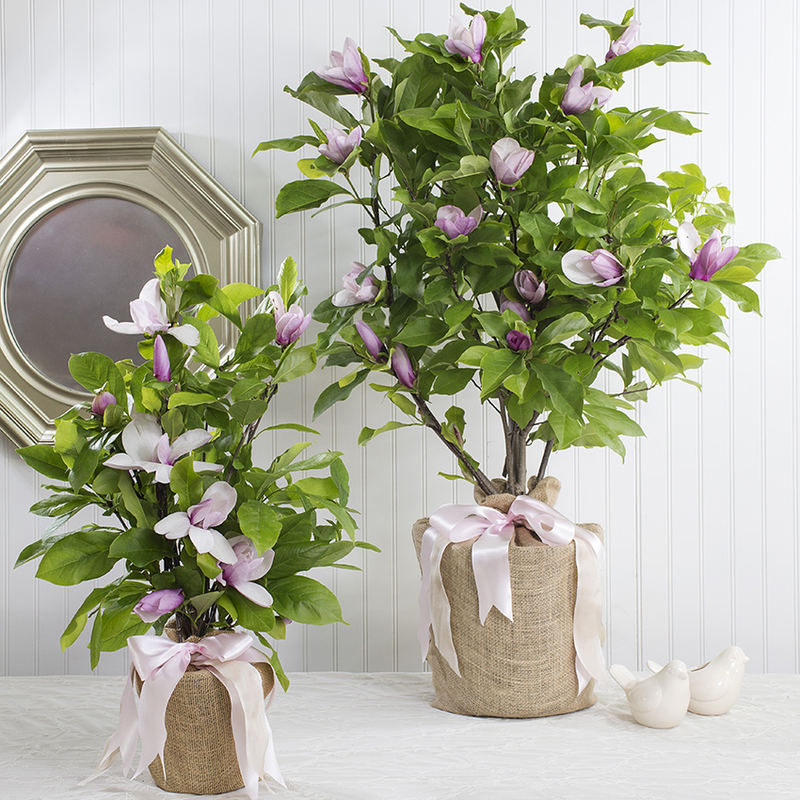 Finally, since it is spring and planting season is almost here, we wanted to share with you two of our most popular spring items from our sister company, Seeds Of Life, a division of The Magnolia Company. Firstly, our “Birthday Pink Hydrangea”. Consumers love these large ruffly blooms set against the deep green foliage. 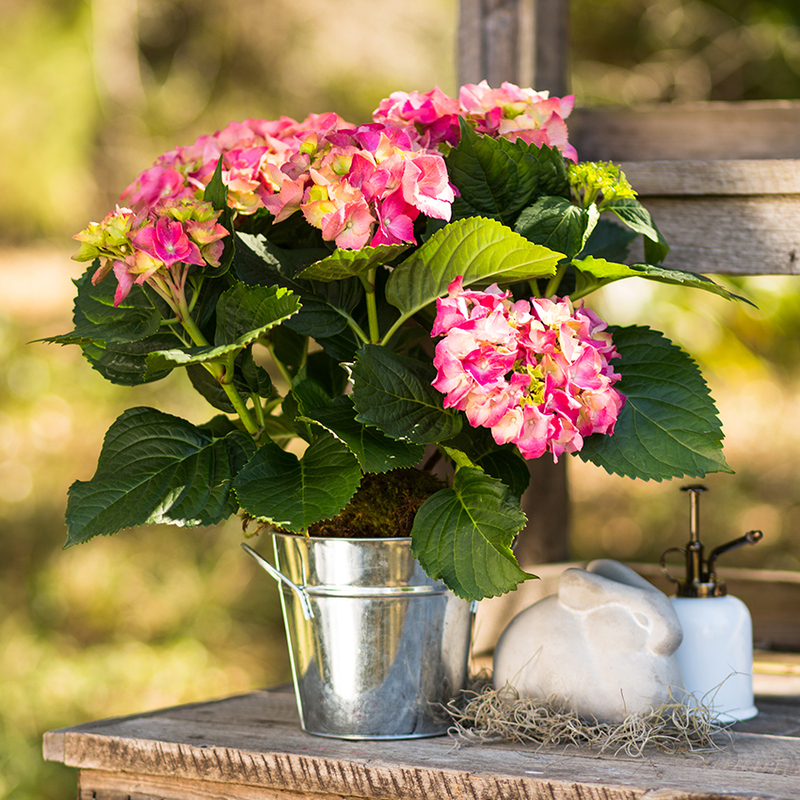 This plant is not only appropriate for birthdays but the Pink Hydrangea makes a perfect gift for any occasion, such as get well, new home, or new baby. Secondly, one of our most popular items is our healthy stock plants of Magnolia trees. Consider giving a living, fresh tree. Once planted it becomes a perfect living keepsake for years to come. So no matter the occasion, whether it is for birthday, Mother’s Day, to mark the birth of a new member of the family or even as a condolence gift, a fresh, living Magnolia tree is the ideal gift.